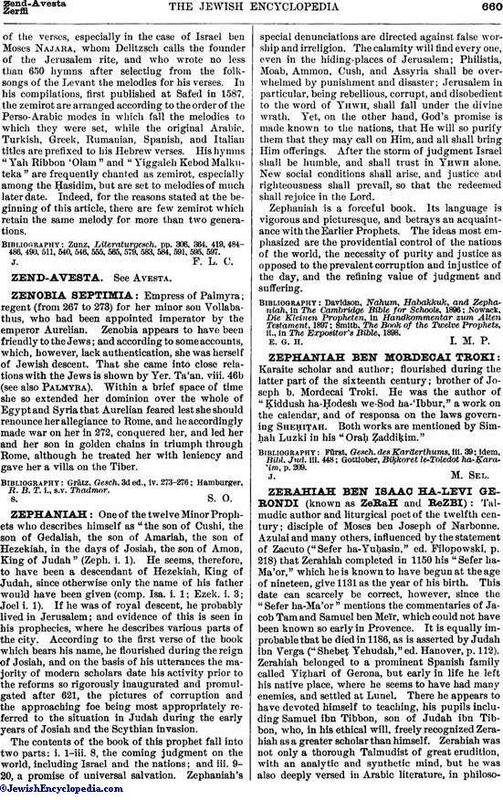 A term applied by the Sephardim to the Psalms in the earlier sections of the morning service. The Ashkenazim, on the other hand, style them "pesuḳe de-zimra" (= "verses of song"), and the term "zemirot" more especially designates the Hebrew hymns chanted in the domestic circle, particularly those which precede or follow the grace after the chief meal on the eve and the afternoon of the Sabbath. Music at table was a regular feature in ancient Jewish life, and the Mishnah expressly states (Soṭah ix. 11) that it was discontinued only as a mark of mourning for the abolition of the Sanhedrin. Even then the later Rabbis found it necessary to insist emphatically on abstention from such domestic melodies (comp. Soṭah 48a), although there were never serious objections to them when they were devotional in character (comp. Music, Synagogal). The singing of hymns at the table (probably selected psalms like Ps. cxxvi. and cxxxvii., which are now used on Sabbaths and on week-days respectively) seems to have been known in the days of the later Midrash, but the ancient custom afterward received a powerful impetus from the spread of the Cabala and the belief in the visits of celestial guests on the Sabbath (comp. Zohar, pp. 252b, 272b, et passim). 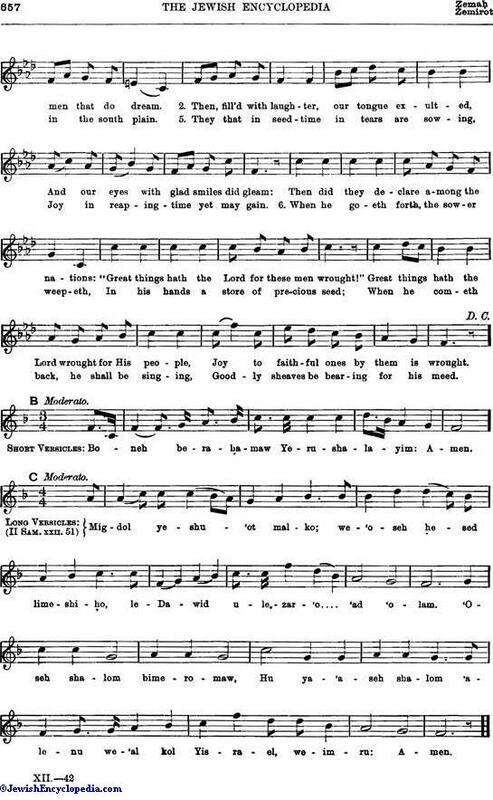 In the sixteenth century many compilations of such hymns were published, especially at Amsterdam and Constantinople. Gradually, however, two favorite collections were formed, one for the Sabbath evening meal and the other for the Sabbath afternoon. A third group was selected for chanting at the close of the Sabbath in order that the "sacred season" might be prolonged at the expense of the "profane" (Shab. 118b; Shulḥan 'Aruk, Oraḥ Ḥayyim, 293, 1), and that the departing Queen Sabbath might be escorted on her way with protracted song (comp. Zohar, p. 208a). 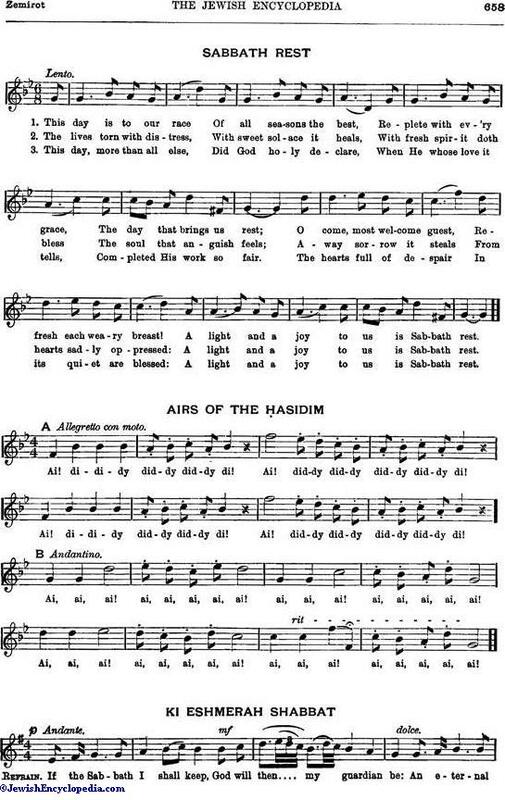 These collections of hymns are still published in such old-fashioned prayer-books as the one containing the "Derek ha-Ḥayyim" of Jacob ben Jacob Moses of Lissa. The authors are among the latest of the payyeṭanim, and the only early medieval hymn in the collections is the "Baruk Adonai Yom Yom" of Simeon b. Isaac b. Abun. 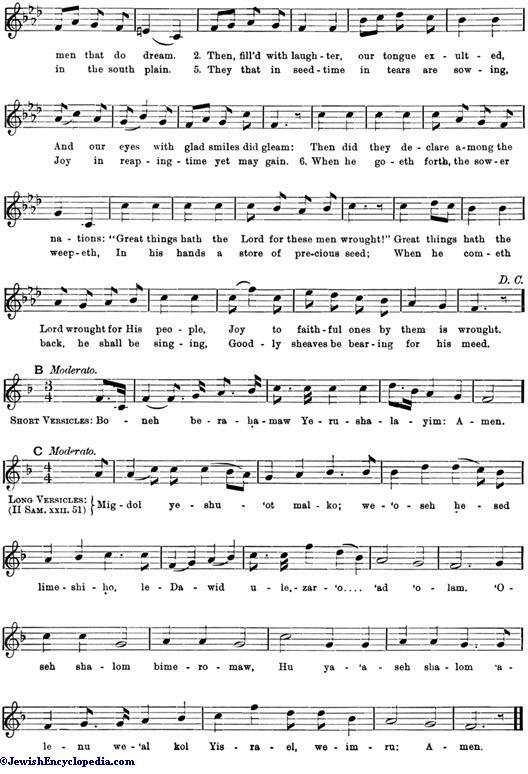 Even later in origin than the hymns are the melodies. Indeed, the ordinary head of a household could scarcely be expected to do more than repeat in the domestic circle the folk-songs which he heard in the workaday world outside. With the growing elaboration of the florid chant of the ḥazzan, it would be difficult for the children at the table even to approximate the intricate ornamental vocalization heard in the synagogue; nor would they be able to analyze the intonations and detect the basis on which they were constructed. Jewish characteristics are manifested chiefly in occasional phrases of synagogal character in which the traditional melody diverges from its folk-song model (comp. En Kelohenu). It was the introduction of these occasional Hebraic phrases into the popular melodies of Gentile neighbors which Chopin deplored when he wrote (F. Niecks, "Chopin," i. 183): "Poor Polish airs! 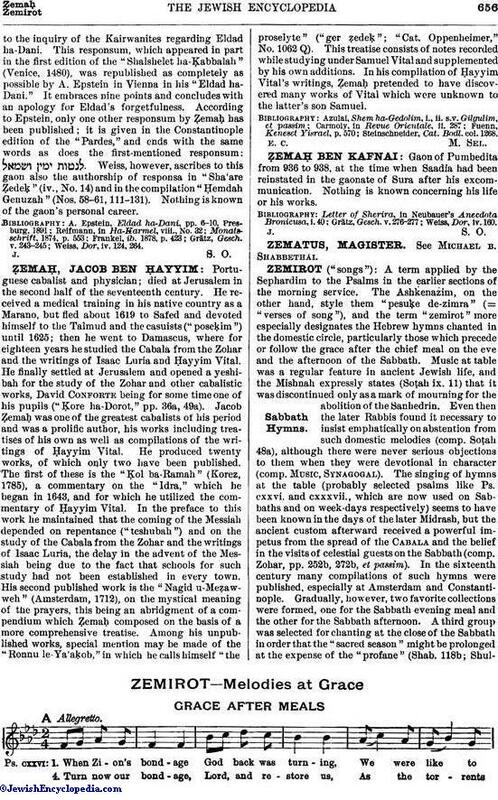 you do not in the least suspect how you will be inter-larded with Majufes" (the Judæo-Polish pronunciation of "Mah Yafit," the opening words of a hymn by Mordecai ben Isaac for the eve of the Sabbath, one of the most popular zemirot). The most wide-spread melodies for the zemirot are those short phrases introduced into the chanting of the grace after meals when three or more adult males are present (comp. 'Al Ḥeṭ). They are South-German in origin, and recall many of the snatches of tune built into the fabric of the Passover home-service. 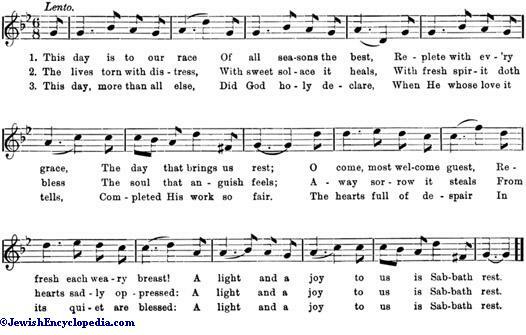 Even where other zemirot are not sung, the psalm preceding the grace is at least chanted. 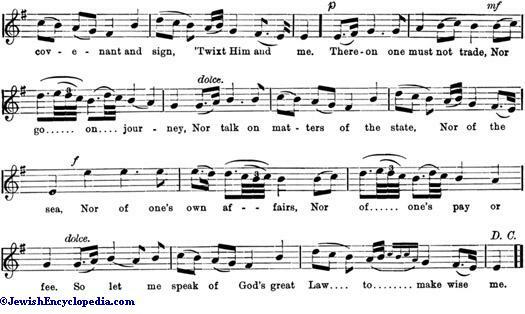 One of the best-known melodies for it is here transcribed. Its instrumental model may perhaps be identified in a violin composition of the eighteenth century. When the whole collection of zemirot is used, they are not chanted to definite melodies, but are read in a sort of cantillation (comp. Oren), and where a selection is made, the most frequent air is a German melody employed either with the "Yom Zeh le-Yisrael" of Isaac Luria or with the anonymous" Ẓur mi-Shello Akalnu." 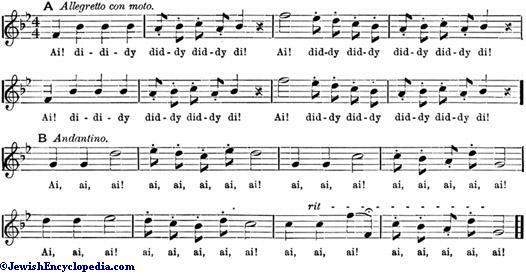 A favorite melody, often used with "Mah Yafit," may be added as an example of the Sabbath-melody popular among the Ḥasidim of southern Poland and Galicia. Together with the melody which follows it, it was first transcribed by Lewandowski (comp. his "Hebräische Melodien," op. 32, Berlin, 1882) as typical of its class. The Ḥasidim affect the chanting both of zemirot and of "songs without words," or melodies set to meaningless sounds; nor are these cantillations restricted to the Sabbath table, since they aim at expressing the joy of the spirit upon all occasions. Two such airs, one from Russia and the other from Jerusalem, are here transcribed. Their recent Slavonic origin is obvious. The Sephardic tunes for the zemirot are sung in a more florid fashion than is usual among German or even Polish Jews. They include many tender airs, of which that for "Ki Eshmerah Shabbat" (a poem often incorrectly attributed to Abraham ibn Ezra) may be instanced. Sephardic tradition is particularly rich in melodies for the conclusion of the Sabbath. One has already been given elsewhere (see Ha-Mabdil), and another, the air to Bemoẓa'e Menuḥah, also is well worth presentation. 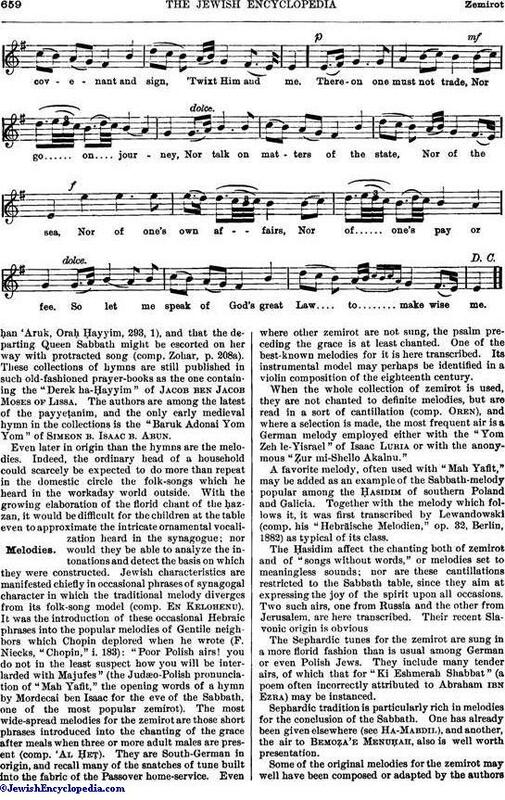 Some of the original melodies for the zemirot may well have been composed or adapted by the authorsof the verses, especially in the case of Israel ben Moses Najara, whom Delitzsch calls the founder of the Jerusalem rite, and who wrote no less than 650 hymns after selecting from the folk-songs of the Levant the melodies for his verses. In his compilations, first published at Safed in 1587, the zemirot are arranged according to the order of the Perso-Arabic modes in which fall the melodies to which they were set, while the original Arabic, Turkish, Greek, Rumanian, Spanish, and Italian titles are prefixed to his Hebrew verses. His hymns "Yah Ribbon 'Olam" and "Yiggaleh Kebod Malkuteka" are frequently chanted as zemirot, especially among the Ḥasidim, but are set to melodies of much later date. Indeed, for the reasons stated at the beginning of this article, there are few zemirot which retain the same melody for more than two generations. Zunz, Literaturgesch. pp. 306, 364, 419, 484-486, 490, 511, 540, 546, 555, 565, 579, 583, 584, 591, 595, 597.